A Case Study in Bakery Maintenance. Using a bakery maintenance software solution to solve a complex equipment problem. Why Use a Bakery CMMS Software Solution? Bakery CMMS software is essential in the fast-paced commercial baking environment. Bakeries generally must produce a fresh product daily. 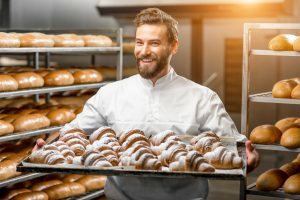 With this in mind, it is clear that maintenance is extremely important in a commercial baking company as the potential for losses are especially high. Preventive maintenance resulting in a reliable product flow is paramount. Designed specifically for use in a commercial bakery, MaintSmart CMMS fits the bill perfectly. 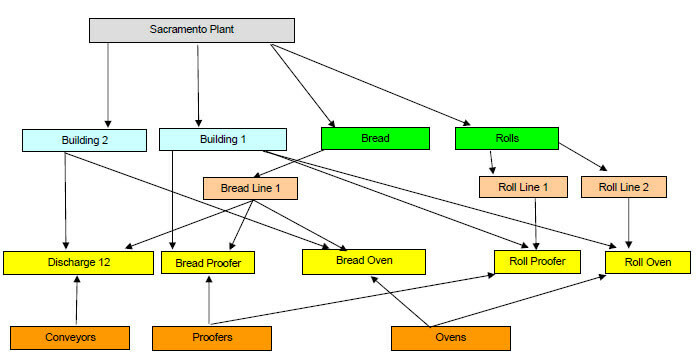 The case study below illustrates why this CMMS works so well in a bakery as well as other food-processing facilities. In this case, unexpected downtime plagues a large commercial bakery. Losses to the bottom line are at a critical stage. Consequently, due to unfilled and late orders customers are lost. The greatest losses occur due to lost production schedule time originating from equipment downtime. The new maintenance manager determines that the old CMMS software is not properly utilized. Moreover, it is lacking adequate analysis tools for assessing maintenance operational efforts. He purchases MaintSmart bakery CMMS software after speaking with other plant managers and maintenance managers in the baking industry. Key performance indicators (KPI) to quantify downtime by count, average, sum and variance by equipment, manufacturing shift, maintenance shift, line, process and location are needed to help solve these issues. In short, he expects the resulting information to guide him in his efforts to turn around the equipment downtime problems. Between each of these processes there are conveyors moving the products from one process to the next. Any interruption between any of these processes has the potential to cause product loss. Equipment failure during proofing process may cause loss of thousands of pounds of unfinished product. Additionally, oven failure or failure to discharge from the oven also results in massive losses. The bakery runs 24 hours a day with two non-consecutive partial down days. Maintenance technician use the down days to perform the majority of the preventive maintenance. 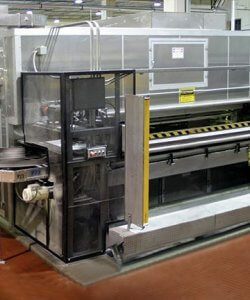 Additionally, the sanitation department is interested in using the bakery CMMS software. However, maintenance and sanitation should be separated allowing maintenance to access sanitation data but not allowing sanitation to access maintenance data. The maintenance manager needs to analyze and group equipment by physical location and functional location. This is a requirement because the Bread Process/Line (a functional location) equipment flows through two distinct physical locations, Building 1 and Build 2 (two different physical locations). After evaluating many CMMS software packages the maintenance manager discovers that all of them use a simply linear equipment hierarchy. This simply does not work for this application. 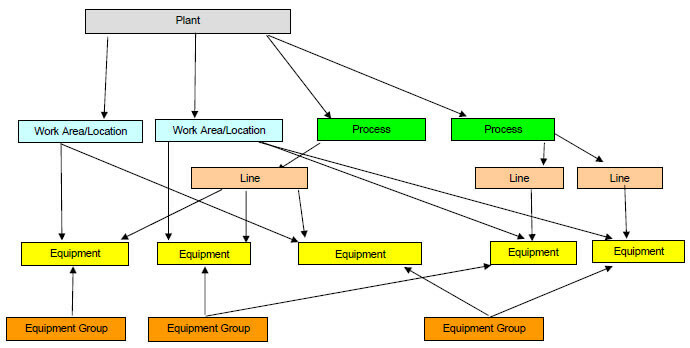 He needs a way to group the same equipment by completely different and unrelated groupings within the same Plant (top-level of the hierarchy). MaintSmart does this. This fact reaffirms the maintenance manager’s decision to use this bakery CMMS software. Analysis and reporting by each process to determine if the problems are process specific. Assess and determine if the problems are specific to the line. To make the determination of the affect the location of the equipment has on downtime, if any. This is especially pertinent in the case where one line runs through multiple buildings. Overall cost to own equipment by Line, Process and Location provides a high-level view of the component costs for spares, work orders, preventive maintenance and downtime. The hope is that this information, when compared to expected costs, will draw out the problem areas at a high level enabling the maintenance manager to drill down to root causes. Make preventive maintenance assignments by zone. The zone could be the location. Since even a few minutes of downtime is extremely costly, locating the correct equipment quickly is essential. This best way to accomplish this is to use Work Area/Location (building) to locate equipment. In some cases, the same line runs through multiple building so using Line for the physical location would not be as efficient. Issuing all preventive maintenance during scheduled or unscheduled downtime when a line goes down is very simple since Line, Process, Technician, Equipment Group, Task or Task Group can assign PMs. The diagram above displays the labels for the equipment hierarchy. Think of these labels as the names for grouping of the items contained within each group. Below is another diagram displaying some of the hierarchy items contained under each labeled hierarchy level. Ultimately, these groups (equipment hierarchy) contain equipment. Move the equipment between groups and/or rename groups at any time if needed. After determining the equipment grouping hierarchy the next step is to build the equipment database. Consequently, the bakery reached out to MaintSmart technical support and learned that this bakery CMMS software is able to import all of the equipment into the bakery production database as part of the purchase. With the equipment in place, the next step is to add task definition and personnel. One person working 4 hours a day creates all tasks and even builds all of the PM task lists for the 200 equipment items in less than one week. This was possible because the program provides a duplication tools that enables the user to create a new PM task list by copying an existing list. Furthermore, this duplication function adds consistency that may not have been feasible if creating the PMs one at a time. Now it is time to go live with the software. Technicians receive preventive maintenance task lists. Simultaneously, the bulk of the work is scheduled on the down days. This results in shifts and days off are adjusted allowing more time for PM work. Accordingly, technicians receive their preventive maintenance lists on each down time automatically by email or printer. The PMs are for the coming due during the next 7 days but are only for equipment that is available because of the down days. Fortunately, this bakery CMMS software is smart enough to manage this scheduling without any user intervention. As a result, the right PMs at the right time to the right person twice a week. After using the system for a couple of months the maintenance manager’s assistant enters equipment downtime records, stored in a notebook over the past 3 years, into the downtime database for the bakery CMMS software. The CMMS analysis module reveals that a costly downtime problem with the Bread Proof Box #1 has plagued the company for the past two years. Bread Proof Box #1 receives formed bread loaves that are not yet proofed (risen). The Bread Proof Box #1 has humidity control that determines the rate at which the bread dough rises. The operator sets the humidity value. This value fluctuates between varieties of product. Too much humidity causes bread to rise too fast. In extreme cases, the dough may interfere with the loading and unloading of the pans to and from the Bread Proof Box #1. The bread pans with the rising dough travel through the Bread Proof Box #1 on shelves. This provides this time needed inside the Bread Proof Box #1 for the bread to rise before entering the oven for baking. Each time this breakdown occurs all product in the proofer is lost. The production department estimates each failure instance costs the company approximately $15000 in lost ingredients, production overtime and clean up time. Additionally, repairing the breakdown consumes approximately 20 man-hours maintenance resources. This major breakdown also forces the bread production department to run into the normally scheduled down day to fulfill customer order. Prior to the latest spate of downtime, the Bread Proof Box #1 was quite reliable. After entering the details of downtime for the past three years, CMMS software analysis of downtime reveals the following. The most costly downtime comes from the Bread Proof Box #1. The highest instance (count of how many times) of downtime is from bread divider. This machine separates dough pieces into the correct size. The highest average downtime in minutes per instance is again the Bread Proof Box #1. Time Down defines the elapsed time period from when the equipment stops to when it is back in full production. Time to Repair is the time maintenance spent repairing the equipment breakdown. Impact is an open filed that is usually used to quantify and account for non-maintenance time losses and subsequent expenses. This is usually expressed in cost/minute or cost/hour. For example, it assumed that a Bread Proof Box #1 breakdown costs the company $6000.00/hour in lost manufacturing time, production overtime costs, sanitation overtime costs, remake of product and lost ingredients. Additionally, Impact includes loss of goodwill for unfilled orders to institutional clients such as various fast food clients. "Proofer shelf jammed" is the primary cause in 8 out of 10 failures. The maintenance shift is 2nd shift in 6 of 10 failures. Second and third shifts operator shift account for equal amounts of machine downtime. The average time down is 178 minutes. The time to repair (average) is 164 minutes. The average impact time (opportunity cost) is 521 minutes. Below is a view of the drag and drop analysis report builder. This is not depicting the same data as this case study. This is an OLAP (online analytical processing) tool that creates any report from any data. After analyzing this data, the maintenance manager determines that the source of the problem with shelves jamming. Specifically, improper humidity settings in the Bread Proof Box #1 cause oversized dough pieces. This causes dough to stick to the pan shelf above it resulting in the pan not properly ejecting from the shelf during the unload cycle. The operator logs humidity settings every 15 minutes, making this data available. 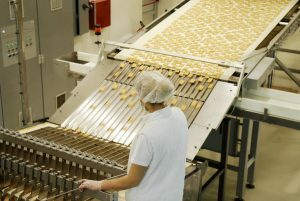 Downtime analysis reports are generated for the Bread Divider since it generates the most downtime instances, however with much less Time Down and Impact time. This reveals a primary downtime cause of variable frequency drive (VFD) speed fluctuations resulting is too large or too small a dough piece. Periodically several over-sized dough pieces (in pans) from the malfunctioning bread divider enter the Bread Proof Box #1. Slow reaction time of Bread Proof Box #1 humidity controller causing too much humidity at times. These times coincide with 2nd and 3rd manufacturing shift change during a product changeover. Oversized uncooked bread loaves in the pan cause the dough to hang up on the shelf above it as it passes through the Bread Proof Box #1. Consequently the pan is jarred from its normal position on the moving shelf. In some cases, this movement is enough to cause a bread pan to jam between two shelves resulting in a major breakdown. The oversized loaf problem went undetected because sudden severe movement of the pans (in the case of a jam up of shelves) causes the risen loaf to deflate suddenly. The maintenance department replaced the speed controller (VFD) on the bread divider. This eliminates the erratic dough piece sizes. Maintenance adjusts the PID controller (this determines how the humidity changes when a change is needed) in the Bread Proof Box #1 to react quicker to humidity demand changes. This solves the problem between 2nd shift (that needed high humidity for their product and 3rd shift that needed a lower humidity for their product. Placing a production break between 2nd and 3rd shift allows temperature equilibrium in the Bread Proof Box #1 during product changeover. Installation of a photo eye that overlooks dough height and warns operator helps to prevent oversized dough from continuing to the point where it caused a jam up. The production office has a new web-based bakery CMMS software terminal installed. As such, production employees can now track progress or repairs and preventive maintenance locally. This is possible because of the ability to set different levels of users with this CMMS solution. Problem solved. The right bakery CMMS software quickly pays for itself. A happy customer of the maintenance team.